Lately, I've been much more drawn to bread baking and less excited about making desserts. This isn't any kind of a permanent mindset--I go back and forth between breads and sweets all the time, but I think I am loving bread making more since I've found some fabulous cookbooks and recipes. Plus I hate dealing with anything sticky, and so many desserts involve sticky processes. I have no problem with a kitchen covered in flour and carrot peels and spilled rice, but messy meringue, or honey, or corn syrup is very upsetting. I just made ladyfingers which is a very sticky, sugary batter, and I found the experience of cleaning up the meringue covered utensils and bowls to be very annoying. I love the simplicity of bread--a few basic ingredients transformed into something magical and wholesome to eat. You also don't need any fancy equipment for bread making--a bowl, measuring cups, and a baking sheet. Making really good bread at home gives me such satisfaction. These little baguettes are my new favorite bread. They are crisp on the outside but so light inside. They have a lovely chewy crust that's not as heavy as some of the other no-knead breads. The dough is an absolute joy to work with. When I was forming it into loaves I kept thinking to myself that it's the "happiest" dough I've worked with. It's very light and full of air bubbles, and very cooperative. You can top your stecca with tomatoes, olives or garlic. I used tomatoes as that's what I had on hand. 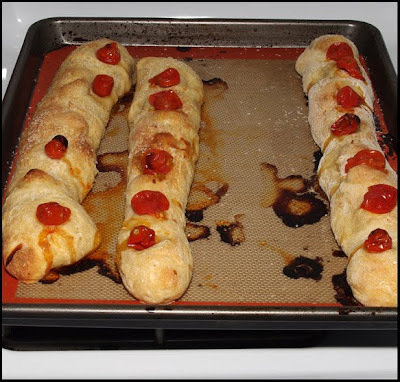 I made the mistake of not pushing the tomatoes into the dough, so many of them rolled off the bread as it baked. Still, the runaway roasted tomatoes were delicious to eat on slices of the stecca. This bread was so delicious that Dave and I ate one loaf as soon as it was cool enough to touch. 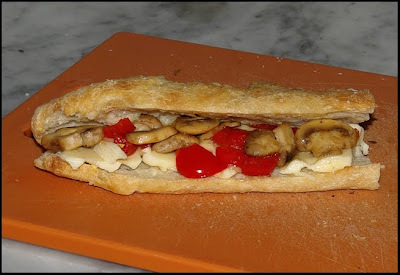 For dinner we made sandwiches with sauteed mushrooms and red bell pepper, and fontina cheese. The stecca works perfectly for sandwiches and panini. I'm already planning on making this bread again, though I may forgo the topping and just have plain baguettes that I can freeze. 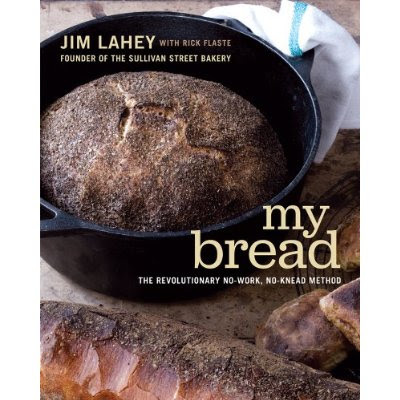 If you've never made bread before, and you're looking for a cookbook that's easy to follow and delivers amazing results, I highly recommend Jim Lahey's book. 2. When the first rise is complete, generously dust a work surface with flour. Use a bowl scraper or rubber spatula and scrape the dough out of the bowl in one piece. Fold the dough over itself two or three times and gently shape it into a somewhat flattened ball. Brush the surface of the dough with some of the olive oil and sprinkle with 1/4 teaspoon of the coarse salt (which will gradually dissolve on the surface). 3. Grab a large bowl (large enough to hold the dough when it doubles in size. you could also use a large pot) and brush the insides of the bowl with olive oil. Gently place the dough, seam side down into the bowl. Cover bowl with a towel. Place in a warm draft free spot to rise for 1 to 2 hours. The dough is ready when it is almost doubled. If you gently poke it with your finger, it should hold the impression. If it springs back, let it rise for another 15 minutes. 4. Half an hour before the end of the second rise, pre-heat the oven to 500F, with a rack in the center. Oil a 13″ x 18″ x 1″ baking sheet. 5. Cut the dough into quarters. Gently stretch each piece evenly into a long, thin, baguette shape approximately the length of the pan. Place on the pan, leaving about 1 inch between the loaves. Embed the garlic cloves, olives or cherry tomatoes into the loaves, about five pieces per loaf. Drizzle, tab or brush olive oil on each loaf. Sprinkle sea salt or kosher salt over each loaf, remember to go light on the olive loaf since the olives are salty. 6. Bake For 15 to 25 minutes, until the crust is golden brown. Cool on a pan for five minutes, then use a spatula to transfer the baguette to a rack to cool thoroughly. Note: The baguette may become a bit soggy in just a few hours because of the salt on the surface. If that happens, reheat the loaves in a hot oven until crisp. I could eat a loaf of this myself, Michele. Awesome bread! I am going to give this recipe a try. That sandwich looks fantastic! I've been baking more bread and I really enjoy it and appreciate the easy clean-up.